In a large saucepan, warm the olive oil and butter together over medium heat. When the butter has melted, add the onions, green chiles and Jalapeño peppers, cook stirring occasionally until the onions have wilted about 3 to 4 minutes. Stir in the garlic and cook 2 to 3 minutes longer, stirring frequently and stopping before the onion and garlic brown. 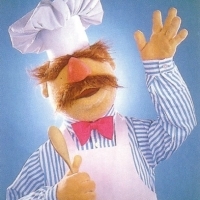 Sprinkle in the flour and continue cooking, stirring continuously until the mixture turns a golden-blond color, about 10 to 15 minutes. Then, whisking continuously, slowly pour in the chicken stock until it is smoothly incorporated, when the mixture begins to simmer stir in the cream, let it return to a simmer. Remove from the heat and add the Parmesan cheese and the chicken base or the bouillon cubes along with the lemon juice and sugar stir until thoroughly blended. Add the sour cream, spinach, artichoke bottoms, Crab meat, Monterey Jack cheese and hot sauce and stir until the ingredients are thoroughly combined and the cheese has melted. Transfer to a warmed serving bowl or a small crock pot on low and serve immediately, or if you would like a browned crust place in a pryex dish and bake at 375 degrees till the top browns, accompanied by the blue and white corn tortilla chips. Try serving it with wedges of fresh-baked Parmesan crusted focaccia bread in place of the tortilla chips. Mmm, yummy! 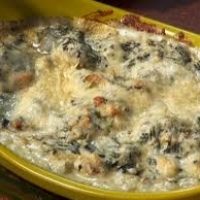 I make a hot crab dip, but adding spinach & artichokes (and maybe ONE jalapeno) would be even better! Think I'll try your version next. OK I'm in !!! This looks great.